Looking for a sharp-looking, well-made sling bag that doesn't break the bank? You've found it with the CARQI Sling Bag! 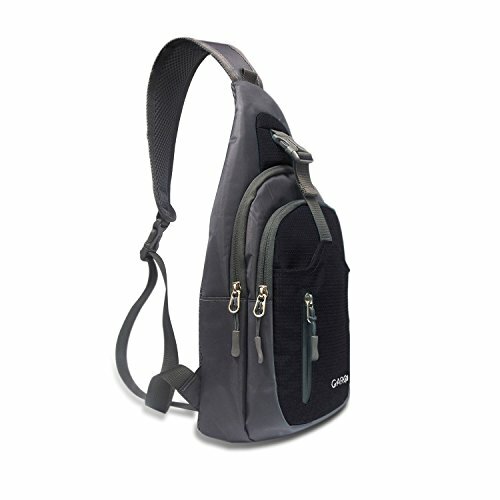 CARQI Sling Bag is a versatile & compact backpack - Perfect as travel backpack, carry on luggage or street/urban style daypack! Made of a lightweight Nylon like polyester material & featuring a spacious main pocket, a fully lined main compartment for clothes, books, camera, medical / first aid supplies, shoes, & more, as well as a pocket that can fit a small tablet. A lined front zippered compartment for quick, easy access to small items. Another compartment with pen sleeves, mesh zip pocket, credit card slots, & key clip/hook. Trendy and oh-so-functional, our bag is ideal for everyone from the busy professional, mom, or college student to bike messenger or outdoor enthusiast. Featuring an ergonomic design, this pack is more comfortable to tote around than a cumbersome backpack that can strain your body. And when it comes to compact storage, it can't be beat! 1. Material: water-repellent and tear-resistant polyester material. 2. Exterior Dimension: 15*8*4Inch (H*L*W). Unbelievable Organized : 4 Main Compartments with one buckle lock to secure all your items. You can put sunglasses, pen, headphones and so on in the foremost and middle compartment, the LARGEST compartment can hold ipad(up to 9.7 inches). Perfect Size: the foremost compartment is 4" x 4.7" ; the button no zipper is 5.5" x 6", the middle zippered is: 7 " x 9", and the LARGEST is: 8" x 10". The belt stretches 40"fully. Only the foremost compartment (Not All Areas) is waterproof, but can not be soaked totally in water for long period. Padded and Breathable: Good construction and lightweight, no more aching neck, ergonomically designed, strap and the back are padded, breathable mesh doesn't make you sweat and forget you're even wearing this bag. Convenient and adjustable: Perfectly works as sling shoulder pack, wear this sling bag over either shoulder comfortably, or across the chest to deter thieves and keep your hands free. You can make the bag firm on your body through adjusting the strap when you're running. Pearl Luster Material :Waterproof and anti-scratch handmade precision nylon, cylindrical pattern and pearl luster material make CARQI shoulder Bag smooth, light , wearable and easy to wash for hiking, kayaking, gym, cycling, traveling, amusement park and daily use. If you have any questions about this product by CARQI, contact us by completing and submitting the form below. If you are looking for a specif part number, please include it with your message.